Listen to the first song of season 2, and find out what else you’ll hear in “Audition”! 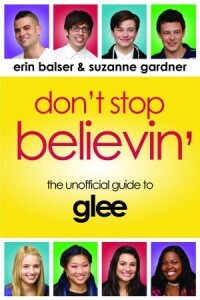 So gleeks, what do you think? I’m not a huge fan of rap songs on Glee, so this isn’t one of my favourites. The girls sound great in the chorus, but the boys don’t totally rock the verses, in my opinion. Nonetheless, it’s super exciting to finally get a new song to listen to! If FOX sticks with the same release schedule as they did with the first season, a full download of the song should be available on iTunes on Tuesday morning. Not sure if you’ve heard all of these songs before? Click on each song title to hear the original version on YouTube! Personally, I’m most excited for “Every Rose Has Its Thorn” – such an awesome ’80s rock ballad! What song are you most excited to hear? And who do you think will be singing which track? Share your thoughts in the comments! Ooh, I’m not sure if i’ve heard all of these but I bet once I hear them they will sound familiar! So excited!!!!! I’m soo excited!!! Check my website out for a better version!! Yaaay only 4 more days to go, I can’t wait! I’m def watching audition. I can’t wait to hear telephone and billionaire.